After reading an extremely insightful article on fashionising.com by a fashion critic, I wanted to bring up the subject of bloggers and vloggers and their growing presence in the fashion world. Although I personally do not define myself as such, there are many others who do and are proud to do so. Being a fashion blogger includes taking photos (usually of themselves in self-styled ‘looks’), updating on the latest fashion news, gossip and events, attending and reporting on fashion shows and reviewing fashion collections or products which are sent from different companies for advertising purposes. In their world, fashion is an intense hobby, an escapism from daily life. Many, such as the prominent The Sartorialist, Tommy Ton, Tavi Gevinson of Style Rookie, Jane Aldridge of Sea of Shoes and Garance Doré have turned their blogs into successful fashion careers. These bloggers are part of the community of fashion bloggers who should be admired for their passion, commitment and professionality and who have developed the fashion blog into a legitimate fashion field. However, as lovely as it would be, I am not going to talk about the inspirational bloggers who care and contribute to the high fashion market. Maybe next time…? For now, though, let’s get back to the rest of the blogging community. The other bloggers do not aim for the professionality with lengthy show reviews or articles. They don’t try to win competitions to get the opportunity to report on the shows. Instead, they write a paragraph of text, stick in photos, comment inappropriately on statuses, articles and others. Every mediocre fashion blog drips with glowing praise and admiration over each collection, gushing at just how wonderful everything is. Is this what blogging has come to? 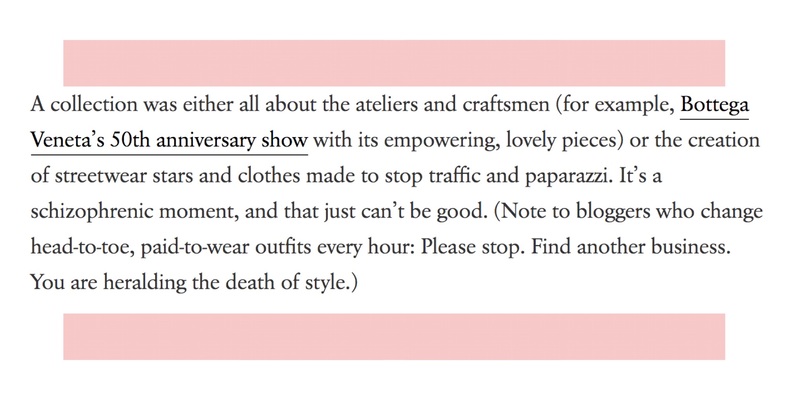 It is a real shame that bloggers have to write squeaky clean reviews of collections to get the next invitation, instead of thinking about their wider impact on fashion. 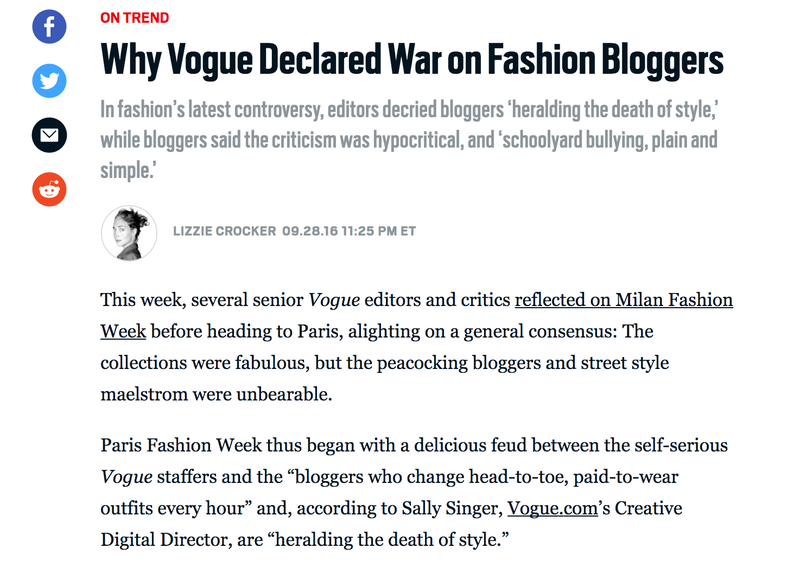 Prominent journalists get shunned if they write scathing reviews of shows or fashion weeks. They don’t want to bend down to the ‘blogger’ way- that if you want to be ‘in’ the fashion circle, you have to praise unworthy designers and leading fashion magazines, without other contributions. Where have the times gone when the opinion of the critic was a make or break for the designer’s collection? If someone wrote a piece which would appear disapproving nowadays, their opinion would disappear from every publishable magazine. Take the head of Central Saint Martins, whose opinion in the fashion world is invaluable. There is not a single written opinion of hers that is not honest and constructive, even if sometimes it is negative. Yet her opinion is not shunned. Is it that journalist and bloggers alike are scared of writing something that might put them out of business? This might be a realistic claim, as for fashion, the financial crisis has not yet gone down. But even if this is the case, can they not differentiate between constructive and intolerable criticism? It is not fair to the designers to create products which are only liked for their populist appeal and that do not push their creativity. No one would believe a critic who wrote solely good things on all aspects of each collection. It is just not what a critic does, and it should be the same for fashion bloggers and professional fashion journalists too. So where has the term constructive criticism disappeared off to? Bloggers use their favourable reviews to gain sponsors, media attention and future invitations and perks. Some say that they want to enjoy all other perks of the fashion insider without putting forward any valuable opinions. Bloggers definitely cannot review a collection negatively, because then where would the next invitation come from..? Stuck in a riddle… What to do in such a situation? If anyone has something to say in this matter, please leave your comments below.